A college student is taking advantage of a loop hole in Michigan's marijuana law by gifting weed along with the purchase of some of his merchandise. 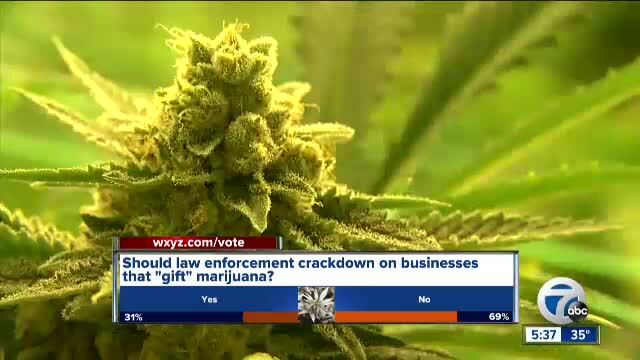 (WXYZ) — Alex Poulos is a 22-year-old student at Detroit Mercy who's now in the business of selling t-shirts that come with a gift of marijuana. His company is called CannaMich. It's an online business that sells t-shirts priced from $80 to $340. Buyers then get a gift of marijuana that comes in flower form or vaping cartridges. He started the business on December 6th after marijuana became legal, but it's still not allowed to be sold yet. Poulos agrees he's using the gray area with the law to operate his business. However, is it a good idea? Alex Leonowicz is head of the Cannabis Legal Group at Howard and Howard in Royal Oak. He says," I've advised my clients not to move into this new venture at all. It's a legally gray area and I just think there's too much risk." He says it's possible law enforcement could find an issue with this. "As licensed dispensaries come online and we see more product coming into the Michigan marketplace, these sorts of individuals are just going to I think fade away eventually because people are going to want tested product. They're gonna want to go with brand names that trust.. that they're loyal to." Poulos believes in his business, but agrees it's probably not something that will be around for long because the gray area will be cleared up soon enough.